Located with a fantastic view of Ellison Bay, directly overlooking the Marina, and with fantastic sunsets viewed from a huge two level deck off the third floor cupola, you never have to go more than a few steps for your days-end activity. The brand new split level Upper Deck gives you a truly unique view of beautiful Ellison Bay. Marina Breeze is a brand new condominium that is tastefully decorated in a mission theme that includes wood, stone and iron, with all of the comforts of home. Our lifestyle is all about relaxing with family, and every component of the condo is laid out in a way where you can gather as a group, or spend some quiet time in the loft, up on the third floor deck and cupola, or on the patio off the Master bedroom. Every room has a view of the bay, and is decorated in a manner to complete your vacation theme. One of the unique benefits of Marina Breeze is that it has dual Master Bedroom Suites (one downstairs and one upstairs), both with a full private bathroom. The two other upstairs bedrooms both sleep 2 with a queen bed in one, and two twin beds in the other. The loft has a pull out sleeper sofa, so everyone will sleep comfortably. One of the fun attributes is the iron spiral staircase that leads up to the third floor cupola and tiered rooftop decks. A pair of extremely comfotable mission style rockers are up in the cupola, that have been known to induce a nap or two. Although there are plenty of restaurants nearby, Marina Breeze has a full modern kitchen with plenty of counter space for both cooking and serving, and a gas grill out back. We hope you get a chance to experience our warm Ellison Bay environment, watch the sun set over the marina and Ellison Bluff, and come to enjoy this little slice of the world as much as we do. Ellison Bay offers the charm of a quiet Artists community, while being centrally located between Washington Island and Sister Bay. It’s just the perfect place to spend quality time with family and friends. Bob & Sherry Stein love Door County, and enjoy the peace and unique qualities of Ellison Bay. We came up to Door County to visit with friends, and fell in love with the quiet charm of this artist community. There is great fishing, golf, shopping, dining, running, cycling, etc. all within a very short distance. The ability to get away from it all, and have plenty to do when we want to is irresistible. Ellison Bay is one of those areas which has yet to be discovered, but is close to all of the activity in some of the other Door County communities. The condo association itself only consists of seven condos (all new), with a full build out of 10-12, so it will never lose that small community appeal. If you loose the car keys for a week, you could walk to food, shopping, the beach and marina, so it is pretty hard to go wrong. A very short stroll will get you to the Viking Grill for meals, or their fish boil on some nights. In short, we came up and Ellison Bay had so many good things that we decided to build here. 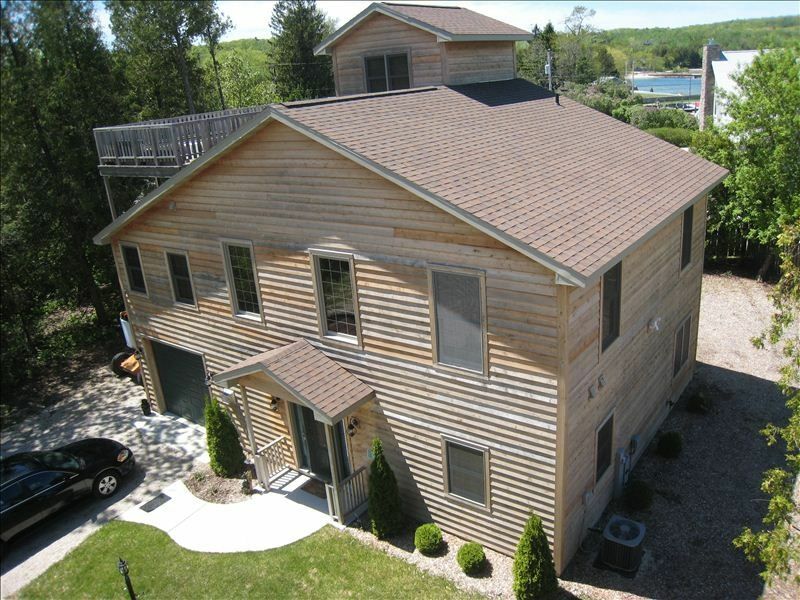 Directly adjacent to the Ellison Bay Marina. Fantastic sunset views from the split level rooftop deck. Definitely the way to close out the day with family and friends. WiFi is now included as part of the rental. This is high speed cable connectivity restricted to use by Marina Breeze only. HD Television (48' Flat Screen) in the Family Room, HD Television in Main Master Suite, SD TV in second Master Suite. Cable TV in the Family Room and both Master Suites. With Aux connection ready to plug in to the headphone jack of your phone or other player. DVD and Blu-Ray Player in Family Room, DVD player in both Master Suites. The back patio has a grill, table and chairs, and is fenced with a spacious back yard for your privacy. Marina Breeze has a brand new rooftop deck with one of the best views of Ellison Bay around. Relax and enjoy sunsets with friends and family from this truly unique vantage point. The 'Sunset' deck is actually a split level deck off of the third floor cupola. Our family has a strong tendency to head up to the cupola and the deck for a late afternoon snack and a glass of wine, and often end up staying there through sunset. After a day of Door County sightseeing, it is a very comfortable,very private deck area with 250 square feet of space where you can have a great finish to your day without going anywhere. We love it and we hope you will too. In the morning, the cupola and the deck are great for you early risers who want a cup of coffee, a book and some solitude. As you can tell, this is one of my favorite spots in our home. Stayed for 4 nights with my husband and adult children. The house was very charming and comfortable. Great location. We had coffee on the rooftop deck every morning and watched the sunset at night. The house had everything we needed for cooking breakfast or dinner. Loved our stay. We spent a long weekend, celebrating some birthday girls. We enjoyed every moment. The house was spacious and perfect for our group. The roof top deck and sitting area was our favorite place to hang out. The views of the bay are perfect. Oh by the way, the Door County Cherry Ice Cream from the local creamery is a must have. Thank you for your review! We love hearing how our guests enjoyed our home! We stayed in this lovely home in August, 2014 and loved everything about it. We are a group of four couples and everyone was happy with their bedrooms and we all enjoyed the house. The short walk to the water was great for watching the sunsets. We have been renting houses on VRBO for the last 18 years and this is by far the cleanest house that we have even stayed in. Often the pictures makes the homes look better than they actually are but I think this house looks even better than its pictures. We like staying in Ellison Bay because it is still close to everything but you don't have to fight the traffic like you do in some of the Door County towns. I stayed at Marina Breeze with my sister, her two teenage daughters, and my mom for a long weekend. This was our first rental in Door County so I wasn’t sure what to expect. Based on the good reviews, I chose Marina Breeze, and as soon as I walked in to the house, I was happy with my decision. The décor screamed relaxation and vacation. Although the fall weather was cold and it was rainy when we arrived, the house was very cozy and comfortable. As we were driving in the rain, my mom said, “I wonder if there’s a fireplace.” By the time she got in from the car, I had the fireplace going. The beds were comfortable, the kitchen was well-stocked with dishes and cookware, and the place was just beautiful. We didn’t use the patio or the roof deck because of the weather, but my favorite spot was the little loft at the top of the spiral staircase with two Arts and Crafts gliders. I snuck up there in the early morning only to find one of my nieces up there listening to her iPod and looking at the scenery. We had a wonderful time in Door County, and a very comfortable stay in your spotless, well-maintained home. My siblings, spouses and I were fortunate to spend 3 days at Marina Breeze. We were looking for a quiet, well maintained space to spend some quality time together. Marina Breeze was perfect. We did a little site seeing but mainly relaxed in the house and enjoyed each other's company. The house was spacious for the seven of us. Sherry is a pleasure to deal with. Thank you for opening your house to us for a memorable family reunion. (One note: We were not able to get the remotes in the upper master suite to work the fan or TV). Our family of 5 stayed at Marina Breeze in Ellison Bay for our summer vacation, we have older teenagers who are mature enough to appreciate the beautiful accommodations. This home is top notch in comfort and we felt as if we were staying in our own home. There is more then enough quiet space to read a book while others play games. The roof deck is beautiful with a lake view of Green Bay, the bluffs and the sunsets; we enjoyed watching the town activity of Ellison Bay from the deck and found this quaint town also to be interesting seeing other people having fun on their vacation. The community park is steps away and another option to watch the sunsets over the lake and perhaps visit with friendly vacationers or locals. There is much to do in Door County, but the best part of the day is returning to this home. For the runners and cyclists, you will not find a nicer place for recreational or training runs and rides. Start your run or ride at the front door, and two quick left turns out of the condo association and you are on your way to some of the nicest roads you can imagine. With slight rolling hills, and well paved tree covered back roads that follow the shoreline, it is pretty hard to beat. I have been fortunate enough to run in a number of countries, and this is one of my all-time favorite routes. If you are just out for fun or in training for the big run or ride, you can pick any number of routes and go as far as you want with little traffic. Of course the best ride is the 3 miles to the Wagon Trail Restaurant to get a giant cinnamon roll to balance out your caloric outflow!